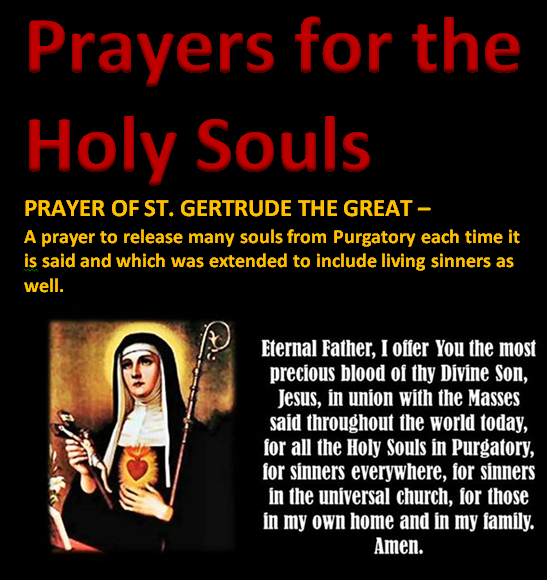 Our loved ones in Purgatory need our daily prayers and sacrifices. This thread is dedicated to them. Pray the Dies irae daily for them. It is a simple, highly effective prayer offered in union with all the Masses said throughout the world. Catholics united in prayer are far more effective than if praying alone. This prayer is offered daily for each soul listed in this thread. Pray join us. God bless you all. These are the words, Latin/English, to the beautiful Gregorian Chant, Dies Irae/Day of Wrath, used in the Requiem Mass in the Traditional Roman Rite of the Holy Catholic Church. When you see the translation, you will understand why I chose this piece for the musical accompaniment to my website. It is a sobering, long forgotten, and much needed reminder of mans finality in this life, with a very clear admonition that we had better be prepared for our eternity in the next. One of the most famous melodies of the Gregorian Chant, Dies Irae is based upon the prophecy of Sophonias 1:14-16, a reflection upon the final judgment. It is important to note that there is the definite promise of hope later on in the hymn, which recognizes from Proverbs 1:7 that Fear of the Lord is the beginning of wisdom. Judgment, which is eternal, is indeed a fearsome prospect for us sinners who in Philippians 2:12 are cautioned to Work out their salvation in fear and trembling. But, as Catholics, we also realize that we have Christ as our Savior, whose infinite mercy is boundless. Many have sadly forgotten, however, that Christ's mercy is also meaningless without His infinite justice. Accordingly, we must be prepared for our final day of reckoning in that we know not the day, nor the hour when we will meet God for an accounting of our earthly journey to eternity. It is in that spirit of preparedness that I dedicate this website, putting on the armor of God, and trying to fight the good fight for Him, and for the Church that He founded upon the Rock that is Peter. Mother and Father; Norm. Jack and Edie. Joyce, Joyce, Lorraine, Fred, Joy, Ray(i), Ray(ii). Auntie Maggie and Uncle Pat. Avril. Len. Bless you, Admin Beautiful thing to do! Thank you..
Eternal rest grant unto them O Lord And may their souls and all the souls of the faithful departed, esp those who have noone praying for them, Rest In Peace. for the Dougherty family. She passed away yesterday. Eternal rest grant unto her O Lord. May her soul rest in peace. Souls added here are prayed for daily - they are never forgotten. Pablo's Son : REQUIEM aeternam dona ei, Domine, et lux perpetua luceat ei. Requiescat in pace. Amen. For my mother and father Bobby and Jack Reinhart and my dearest friend in life and faith Diane Braun. May they rest in peace. especially members of Third Order of Our Lady of Mount Carmel. Please pray for the repose of the soul of Daniel McDonald a young man who died suddenly. Mr Bill Woolmore, Cousin Michael, Good friend David Man.